Every once in a while, the stars line up. 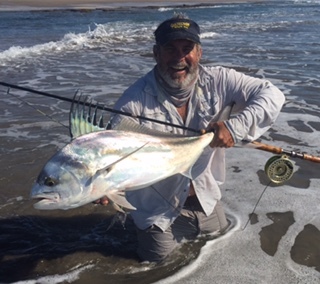 Last week, I caught 17 grandes on the fly, sight casting. 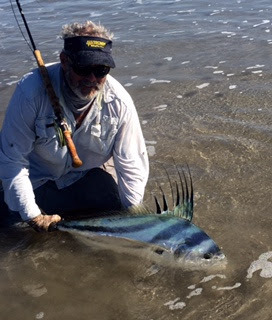 This last week, I had the experience of a lifetime, and something I haven't seen in over 20 years..A giant school of roosterfish, right next to the beach, and light winds, with small waves. It was heaven for sure. I fished with my guest for the first two days. We were sight casting for the in the waves. We would see them sideways in the wave, then we would cast the fly over the top of the incoming waves, and then the waves crashed on top of us> were waited until the white water went past us, then we would strip the flies. 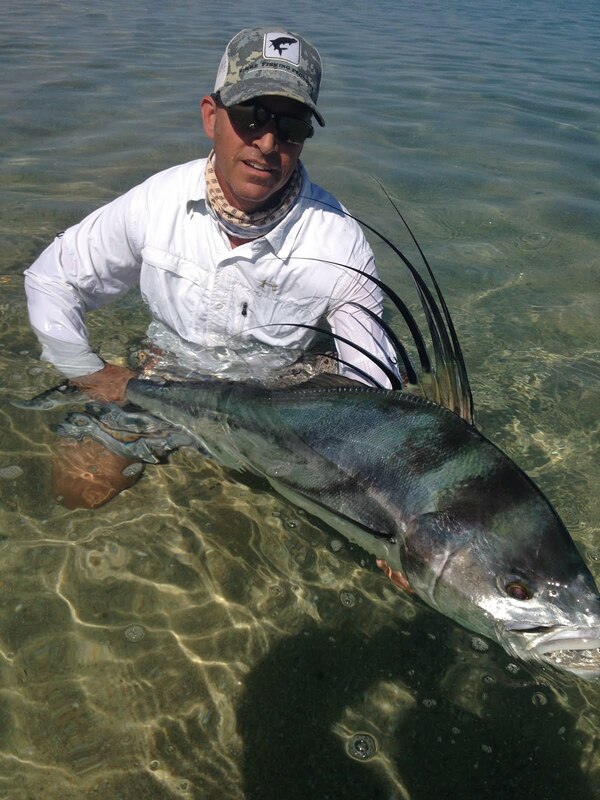 Huge Combs would come out of nowhere and the fish would jump on the fly. It was crazy fishing. 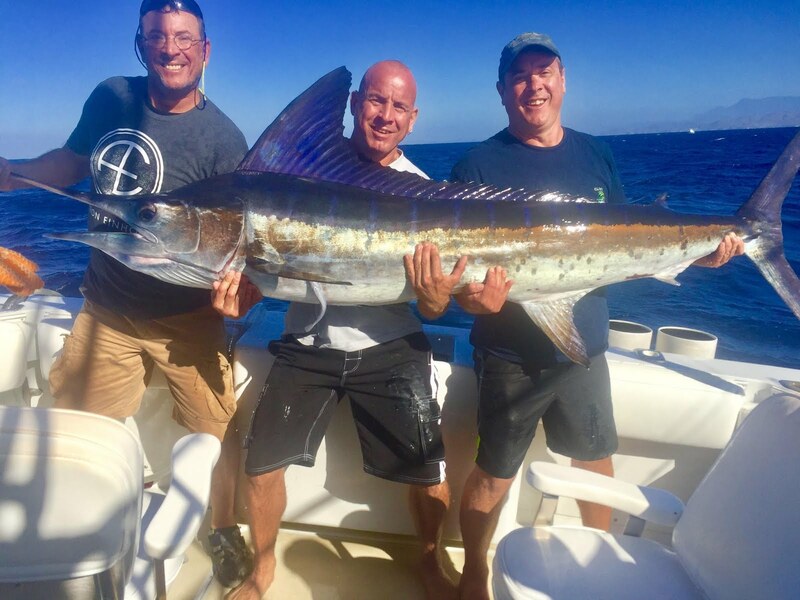 Most of the fish were 20 to 35 # but some went up to 50 lbs. We would hook up, and the fish would run and take a bunch of line off our heavy drags, then we would walk back out of the waves and release them and run back into the surf to do it all over again. Most of the fish would miss your fly in the waves. My guest wanted me to fish with him, so twist my arm and I got my 10wt Loomis out for a spin. 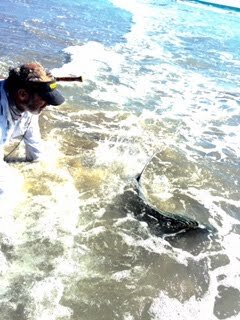 It was so cool to see the fish coming through the waves, turn on your fly and comb up. many times the waves would bust on the fishes backs. I caught 5 Grandes on the fly while guiding that day and 5 more the next day. Now thats what I call guiding. Actually I never like to fish when I guide, but my Guest has been fishing with me for years and we are close friends. When he saw what was going on and he knew that this was a once in a lifetime experience, he wanted me to fish with him. I went back on my own the following day with my daughter Louise, but most of the fish had moved on, and the waves had doubled in size making fishing extremely difficult. 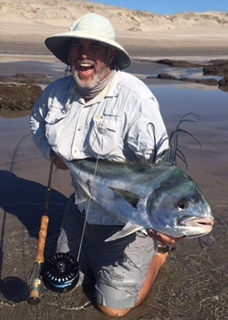 I used my 12' 10wt TFO Spey rod, and boy did I get the heck beat out of me. The waves were big and they threw me around like a washing machine, but I kept on fishing. I caught 7 Grandes that day on the Spey rod and it worked flawlessly. The TFO Spey was too much fun to use and the extra length really helped me get over the waves. I broke off so many big fish it was crazy. 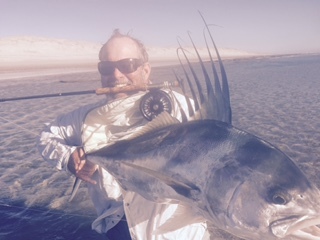 The bigger fish would turn on the take and use the waves against me, breaking 30# tippet like it was 10# test. In those 3 days, I must have caught another 40-50 fish around 10-12 lbs. I went back the following day and checked out all the beaches and the fish were nowhere to be found. Santa was very good to me this year.. 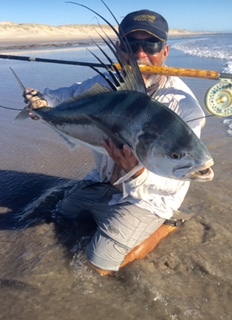 I doubt anyone has ever caught that many big roosterfish off the beach with a fly. Actually I did, but it was 20 years ago, and thats another story. It was WAY too much fun, and I have never been so tired,beat up, and so happy. We didnt get a lot of pictures as we were too busy fishing, but we got a few. Now thats a memory of a lifetime.